Office of the VP for Research | Hey, Andria. There’s nothing quite like completely overhauling a website. 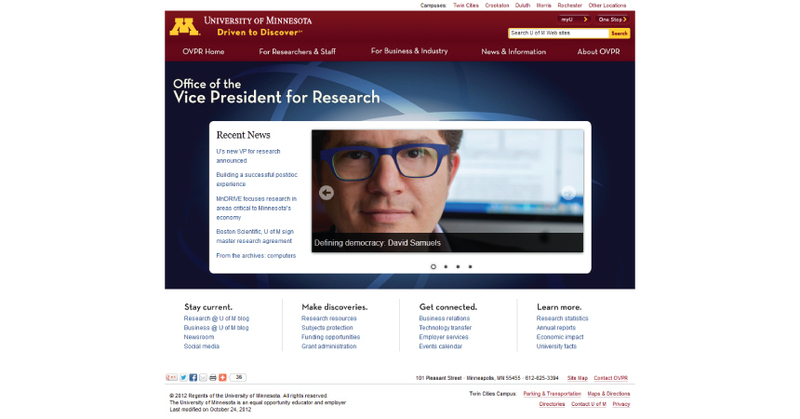 That’s what I did for the Office of the Vice President for Research at the University of Minnesota. Based on metrics and usability testing, I was able to develop a new architecture for the site, refine the content strategy and most importantly align the styles with U of M brand standards. We made the site more intuitive and utilized compelling graphics and imagery to better tell our story. The content is organized, the code is clean, and it’s pretty sharp-looking (if I do say so, myself).